AN OPENING GAMBOL through Henry Mancini’s The Days of Wine and Roses offers little indication as to what else lies behind the gatefold covers of Eyal Lovett’s double album Tales From a Forbidden Land. Clearly stated as a trio recording (with double bassist Kenneth Dahl Knudsen and drummer Aidan Lowe), the Israeli pianist/composer also features the mellifluous, pedalled electric guitar hues of Gilad Hekselman in an absorbing programme of, predominantly, his own works. Lovett’s approach and use of instrumentation has a distintinctive aura – specifically, the influence of romantic classical piano (sometimes solo) coupled with sprightly, South-East Mediterranean rhythms and melodies, balanced with an introspective, heart-on-sleeve sensitivity which genuinely becomes enthralling. Based in Berlin, and regularly touring European venues and festivals, Lovett describes these ‘tales’ as “an attempt to capture some aspects about the experience of being an Israeli artist living abroad”, and says it’s “also a metaphor, for each of us has our own ‘forbidden land’.” It’s an album of discovery, whose fascination never seems to wane (even across two discs); and listening-in feels like a personal, intimate response to the moods which unfold. Entry Point‘s dark, tentative steps over arco bass suggests an almost Tchaikovskian journey into the unknown, albeit with Middle Eastern piano and guitar inflections, whilst Odelya‘s lilting piano jazz acceptance prompts tremulant, gossamer echoes from Hekselman. The riffy bass definition of Daphna Eilat’s A Song For a Beloved Land is more buoyant – sunny, even – with Lowe’s percussion shaping its affable melodies (this band’s sense of control and expression is immaculate); and Hope Without Borders combines lush chordal and melodic piano with a spirited, unified momentum (the inspired connection between trio and guitarist especially reinforced here). Wistful piano mazurka, Japanese Tale, is typical of the continual thread of emotion, its delicate waltz time brightening to include Hekselman’s pinpoint improvisations; and the more whimsical grace notes of Little Ones relax into sustained Lisztian lyricism, inviting Dahl Knudsen’s sympathetic bass extemporisations (remarkably affecting). Bitter Sweet‘s discordant, major-minor waltz stays long in the memory, diverting along unexpected, textural and rhythmic avenues – perhaps that’s one of the secrets to both the originality and interest of Lovett’s music; and bluesy, crescendoing, Esbjörn Svensson-like Something Begins, Something Ends once again integrates Hekselman, this time in particularly gritty, pitch-bent majesty. There are so many treasures here – and these eighty-four minutes have, over a period of time, repeatedly called me back to focus on their intricacies and their sincerity. At the moment, I wouldn’t stray far without this very special collection (and the trio’s 2013 debut release, Let Go – with Malte Schiller and Ramiro Olaciregui – offers more sublime beauty). Touring in 2017, a UK visit from the whole quartet would be warmly embraced. Tales From a Forbidden Land is available, as CD or digital download, from Two Rivers Records at Bandcamp. Videos: A Song For a Beloved Land and Japanese Tale. THE UNEXPECTED, EMOTIONAL SWIRL of pianist and composer Maria Chiara Argirò’s debut release The Fall Dance has me in raptures as its engaging, visceral expressions of explosive excitement and sweet serenity unfold. Available from Proper Music, Amazon, iTunes, etc. Watch the promo video here. THIS ICELANDIC trio release from pianist/composer Ingi Bjarni Skúlason and colleagues can stand proudly amongst the finest of the current genre. 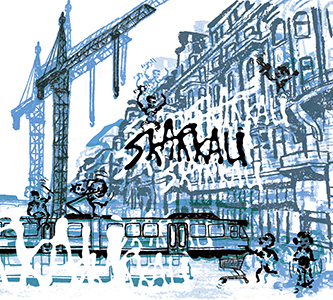 Completed by bassist Valdimar Olgeirsson and drummer Óskar Kjartansson, the Skarkali Trio’s debut album Skarkali (translated, loud noises) carries a depth of invention, verve and delicacy which sets it apart from any run-of-the-mill piano trio expectation. Available as CD or download from Bandcamp. 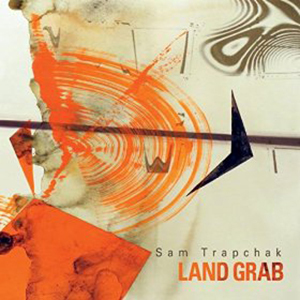 Land Grab – the second release, as leader, from Michigan-born double bassist Sam Trapchak and his irrepressible quartet of Greg Ward (alto sax), Tom Chang (electric guitar) and Christian Coleman (drums) – hits a remarkable balance of compositional and improvisatory verve; and its the raw power of frontline alto and guitar combined with robust bass and drums which holds the attention throughout, as well as an impressive ability to snap from lush, lofty chordal jazz into irresistibly gutsy hard rock riffs. Tom Chang’s prominent, sustained and enquiring guitar style is likely to draw a good few comparisons – easily John McLaughlin or Pete McCann; perhaps John Abercrombie, Allan Holdsworth or John Goodsall – sharing a great voicing affinity here with saxophonist Greg Ward to pull off a raft of audaciously complex unison lines. Take, for example, bold, swaggering Lumpy’s Blues which, buoyed by the thunderously percussive rhythms of Trapchak and Coleman, resounds to brash, Led Zeppelin-like guitar-and-sax riffs; and Trapchak himself displays an animated bass pliancy reminiscent of Dave Holland or Ben Allison. Pterofractal, which opens the album’s extended six-track sequence, soars deliciously to a frenzy of clanging guitar mixed with unfettered, Steve Coleman-like sax; and the searching ambience of Beautiful/Furious switches into fabulously overdriven, pitch-bent wailing from Chang. Here again, sax and guitar connect superbly in shrill, on-the-edge improvisation as Greg Ward’s alto sputters and swoons to the fierce rhythm (as writer, Trapchak rarely seeks the limelight, but is clearly the backbone of this quartet). The briefest and most insular of the tracks, Bell Curve, is a lightly-trod episode of rising and falling contrapuntalism, predominantly for drumless trio – fascinating to hear how the differently-textured, almost Bachian melodies intertwine; and, introduced by Trapchak’s phonetic bass solo, nine-minute Breathing Room opens into a broad, prog jazz landscape redolent of the work of Asaf Sirkis or Nguyên Lê. Title track Land Grab closes the album in a blazing Weather Reportian/Mahavishnuan maelstrom fired by the persistent pulsation of bass and drums; and Ward’s lower alto register, not unlike Shorter, becomes hypnotic when combined with Chang’s piercing, seemingly McLaughlin-inspired soloing. Released on Raw Toast Records, Land Grab is available from CD Baby as well as iTunes and Amazon. Sam Trapchak’s intelligent compositional prowess is intuitively realised by this fine quartet, and turning up the volume is requisite… but just keep those ‘air guitar’ hands on the steering wheel!